The fourth annual Executive Sustainability Forum brings 25 leaders from corporations, NGOs, and government to Hanover for two days of lectures and peer learning. Perhaps it should come as no surprise that, according to a Gallup poll, Americans are prioritizing economic development over environmental protection by the largest margin in 30 years. But ask the corporate sustainability officers from companies such as IBM, Caterpillar, and Siemens, who will be at Tuck on October 24 and 25 for the Allwin Initiative for Corporate Citizenship’s fourth annual Executive Environmental Sustainability Forum, and they might have a different answer. It’s their mission to make their companies greener and more efficient while maintaining profitability, something that’s increasingly difficult to do in a competitive marketplace without strong environmental regulations. 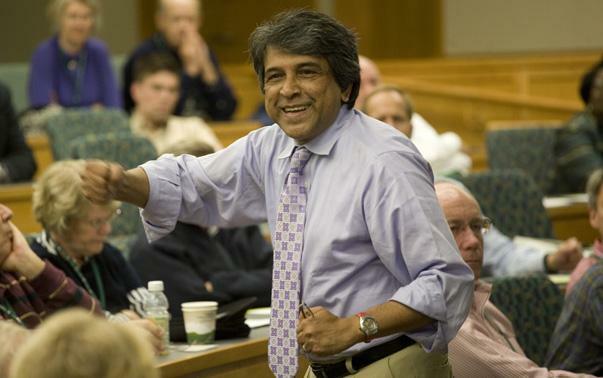 The event, which is co-sponsored by Waste Management, Inc., consists of a series of closed-door sessions with participants, Tuck faculty members, and students on topics such as the academic perspective on business-government relationships, corporate sustainability and government affairs, the changed environment for sustainability, and enabling public-private knowledge flows. In addition to executives from major corporations, there will be representatives from the U.S. Department of Energy, the Pew Center on Global Climate Change, the Natural Resources Defense Council, the Carbon Disclosure Project, and the Lawrence Livermore National Laboratory. For Sundaram, who specializes in finance and teaches a course the impact of climate change on corporations, regulating carbon isn’t just an environmental issue; it’s also a threat to businesses’ balance sheets, and a huge opportunity for economic development. For example, Sundaram notes, the companies on the S&P index emit about three billion metric tons of carbon dioxide per year. If those companies were required to buy carbon credits at current market rates, they would have to pay roughly $75 billion to society annually. It’s a major contingent liability that Sundaram wants corporations to understand. If economic development and environmental protection are not mutually exclusive, maybe Gallup is asking an outdated question. The more constructive conversation, which will take place during the Forum, is how greening the business world can create revenue, lower costs, and boost the economy.